Categories: [Choose]DogsHorsesOther - What type of event is it for ? 1 Placement Rosette- Two Tier of tight box pleat with matching colour 50mm printed centre, With the position of "Placement eg. 1st" in the centre. Colours may vary from stock photo. You will need to tick the drop down menu for your position. You will need to tick the drop down menu for your back fixing. You will need to tick the drop down menu for categories. 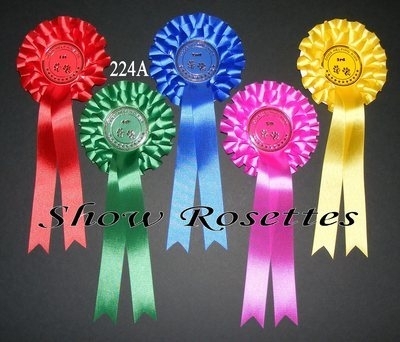 These are stock rosettes No event name will be included. If you wish to have your event/show wording around the edge please contact us.